Will There Be Another Triple Crown Winner? "Congratulations to I�ll Have Another, J. Paul Reddam, and everyone on Team O�Neill!" said C. Steven Duncker, Chairman of NYRA�s Board of Directors. "We are thrilled to welcome the Derby and Preakness hero to New York for the Belmont Stakes on June 9. I�ll Have Another will attempt to make history as the first Triple Crown winner since Affirmed in 1978, and is the first Triple Crown hopeful to try the Belmont Stakes since Big Brown in 2008. We anticipate a spectacular day of racing three weeks from now, and look forward to welcoming fans to beautiful Belmont Park." Belmont Park Race Track...And They're Off! The horses come thundering down the track, the jockeys urging them forward. The crowd roars on its collective feet. You stand, shouting with everyone else: "Go, GO, GO!" And in an instant you're either a happy winner counting your money, or sadly ripping up your tickets. But wait, there's another race in about 20 minutes. You're at Belmont Park Race Track, and the excitement continues. Belmont Park was originally opened in May, 1905 and it wasn't strictly for horse racing. It was also the site of aerial tournaments and shows, including the 1910 International Aviation Tournament, one of the top aviation events of the time. Nor was Belmont the first, or the only race track to call Long Island home. In the first half of the 1800s there were several tracks including the Union Course near the site of Aqueduct (currently Long Island's other horse race course) and the National Course near what is now LaGuardia Airport. Another track, the Centreville Course appears to have been located south of Rockaway Boulevard and east of Cross Bay Boulevard in Ozone Park. (See Note below). After the Civil War, racing in New York changed considerably. At first tracks were built with enthusiasm. Aqueduct, Brighton Beach, Coney Island, Gravesend and Sheepshead Bay were the sites for a spate of new tracks. The Jockey Club, under the leadership of August Belmont II, one of the most powerful men in racing, began to purchase properties to build a new track, patterned after the great race courses of Europe. And, finally the original Belmont Park opened on March 4, 1905. But the golden age was interrupted. Anti-betting legislation was passed, closing track after track. Belmont too was almost a victim of the legislation. It was closed for two years but reopened in 1913. The gracious race track that stands today has been renovated, actually rebuilt. First it was damaged by a fire in 1917, then structural defects in the grandstand closed it again from 1963 to 1968. 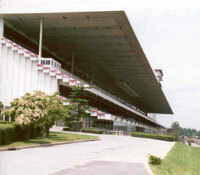 Finally, on May 20, 1968 Belmont reopened, and it has been opened for racing since. From the wealthy horse owners and their friends through the working folks from the neighborhood Belmont's appeal crosses all lines. The Backyard picnic area with food concessions and playground plus free concerts and events. Check NYRA website for scheduled days and events. Belmont makes a good case for bringing the whole family on a day's outing. You can choose the Grandstand, but for the extra $2 a person admission, it's worth pulling up the driveway to the landscaped Clubhouse entrance. The Clubhouse is also quieter and with better places to eat. It's well-maintained and the bathrooms are clean. Going to the Clubhouse also gives you access to the Grandstand. The guards will stamp your hand so you can cross back and forth to get a better view of the finish line. Gone are the days of losing tickets covering the floor. Frankly, we kind of miss it. There was something quite concrete in a carpet of losing tickets. But perhaps that's the reason maintenance keeps the area so clean. The focus is clearly betting. We're $2 bettors, and we bet to place. This means that if our horse comes in first or second we win money. Buy the expanded racing program that gives you background information and the history of the horses and spend a few minutes handicapping the race, trying to figure out which horse will be the winner. There's usually 9 races a day so for $18 you can have all the excitement of watching your horse come thundering down the track. Since you'll be there for several hours, you'll get hungry. There are plenty of places to eat. On the 4th floor of the Clubhouse is the Garden Terrace, a glass-enclosed restaurant, and the only place at the track with a dress code. We tried the buffet and found the food merely adequate. Some of the tables have personal television monitors, others overlook the track, but you won't be able to see the action from all the tables, so select carefully. There's also the Paddock Dining Room, which overlooks the paddock area, for sandwiches, and salads, and the Belmont Caf� serving hamburgers and hot dogs. The Belmont Caf� is also the site for Breakfast at Belmont. We've always said we were going to get up early, and go have breakfast while watching the horses work out but somehow 7 AM is just a tad bit too early for us. 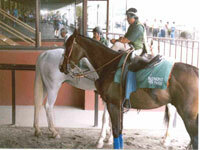 Still, if you love horses, and race horses are powerfully beautiful, it might be worth shorting your sleep to try it. More food is available in the Food Court, and other locations. And then, there are the bars, and the eating facilities of the Grandstand. The staff is friendly and helpful, there's plenty of seating, lots of food choices, and more fun than you think. And you get to see some of the world's fastest and beautiful horses. 718-641-4700 (Note: despite the 718 phone number, the track itself is located in Nassau County, with just a sliver along the Queens,NYC border). According to one loyal reader, KTZ of Queens, to this day you can still drive on Centerville Street named after the race track. The recommended reading on this fascinating piece of history is THE HISTORY OF WOODHAVEN & OZONE PARK or stop by the Long Island room at the Queens Jamaica library. Our thanks to KTZ.